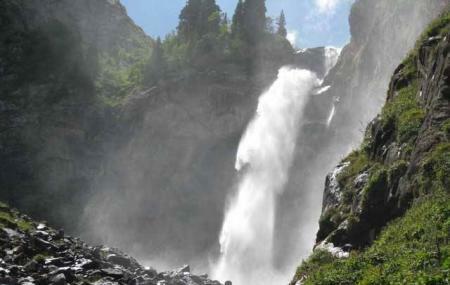 Barskoon Waterfall is a 24-meter cascade, a gem of Kyrgyzstan. It was given the status of a national monument in the year 1975. Climbing up the neighboring mountains is a joy, especially during the summers, as the tiring climb results into the sweet water of the destination. While it is also accessible by car, youngsters prefer to go here as a weekend adventure activity. There are two falls, the upper and the lower falls. Trekking is great fun and the journey is worth the view. Create a customized plan for your visit using the Bishkek trip planner. You can use ready templates or start from scratch for the same. Add accommodation and hotels in Bishkek that suit your budget including the most recommended ones like Urmat Ordo, Asia Mountains 2 and Bishkek Boutique Hotel. Chalk out the best way to discover the city with Bishkek vacation packages. Check out various modes for how to reach Bishkek. Love this? Explore the entire list of places to visit in Bishkek before you plan your trip. Fancy a good night's sleep after a tiring day? Check out where to stay in Bishkek and book an accommodation of your choice. How popular is Barskoon Waterfall? People normally also visit Victory Park while planning their trip to Barskoon Waterfall. Very nice waterfall. If you would like to make a light hiking, going to Barskoon waterfall is best desicion. Nice waterfall but it takes a relatively steep walk uphill to reach it. Seems to be a favourite spot because when I visited there was a bridal couple taking pictures with photographer et al. The water falls into a small pool which runs into a small rivulet. Could be stronger in rainy seasons. Fairly steep but short hike up to the small waterfall. Looks like a scramble/climb up to the higher one...we didn't go. Would be a good day trip with a picnic! Easily one of my favourite places in Kyrgyzstan to visit. I highly recommend going in winter as well when the waterfalls are all frozen.